One very useful assessment tool is the HOMES (Health, Obstacles, Mental Health, Endangerment, Structure and Safety) Scale, developed by Dr. Christiana Bratiotis. This simple tool allows rapid assessment of multiple issues related to any type of hoarding case. Another scale specifically targeted to canine welfare is the Tufts Animal Care and Condition Scales. This scale is designed to assess a dog's body condition and physical health, environmental conditions and sanitation, weather temperature safety and physical care. Each hoarding case is unique, and any approach should draw on a palette of solutions. Approaches can range from a therapeutically oriented, cooperative approach to a highly adversarial prosecution for animal cruelty. A middle ground involves a combination of "carrots" and "sticks" in order to achieve cooperation and compliance. 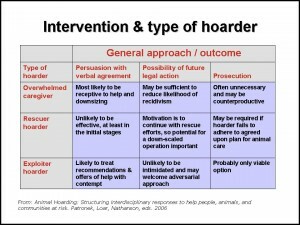 The diagram on the right contrasts the different approaches for intervention, based on a typology of hoarding as described in the community guidelines report. A social work approach to a more therapeutically oriented intervention is outlined here. It is important to keep in mind that the presence of animals, even when squalor or hoarding of objects exist, does not necessarily imply that animals are being hoarded. This relationship is illustrated in the diagram on the right. For example, some people may hoard objects and also have a few pets, but not be hoarding animals specifically. Others may be living in squalor and also have some pets, but not be hoarding anything. In these latter two situations, animals may still be at risk, but the interventions selected must account for the primary condition present. Although squalor can be a prominent feature of hoarding, the relationship between living in squalor (sometimes called "Diogenes Syndrome") and hoarding is poorly understood, and in the psychological literature, the two subjects are not frequently discussed together, despite their apparent commonalities. Indeed, the contribution of Axis II disorders to worsening of functional impairments in people living in squalor (particularly elders) has been noted. The government of New South Wales, Australia, has issued a lengthy handbook for field staff to assist people living in severe domestic squalor, which can include animal hoarding. Due to the complexity of hoarding cases, more and more communities are beginning to recognize the importance and benefits of a multidisciplinary approach. This was outlined in our community guidelines report. More recently, under the leadership of Anne M. Kaup-Fett, R.S., M.S., Clark County in Springfield, Ohio, has established a county-wide hoarding task force to better deal with all types of hoarding. They have graciously shared their material and expertise here, and have made the following resources available as models for other communities to use: Sample advertisement, Task force guidelines, Sample phone tree, Scoring system for hoarding, and a Sample referral form. Ms. Kaup-Fett has identified several factors that are important for establishing a task force and making it succeed. First and foremost, there must be a committed local host who is willing to arrange first meetings, contact new employees of member agencies, and keep the group going with occasional emails, memos or some other form of communication. Second, it is important to have some sort of formal presentation to help that person transform interest into action. One of the challenges for any group is maintaining interest. The group cannot sustain itself simply by trading war stories. Scheduling speakers on relevant topics can help keep task force members engaged. The range of topics is quite broad when one considers all of the interwoven problems that affect hoarding, including elder abuse and self-neglect, child protection, sanitation issues, mental health issues, suicide prevention, HIPPA requirements for sharing information, and animal welfare response. 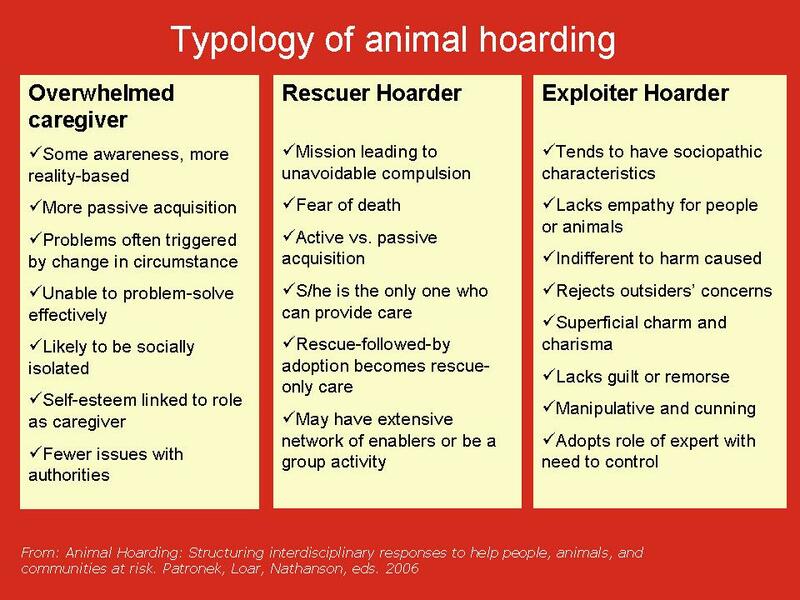 Therapy for animal hoarding is still in very early stages and there have been no controlled studies of treating animal hoarding. There are few people in the country who have significance experience treating animal hoarders. Much has been written about treating object hoarding, particularly OCD-related hoarding. Compulsive hoarding is now recognized to be more different than similar to OCD, and most hoarders do not have other OCD symptoms. There is a movement to recognize hoarding as a new and distinct disorder in DSM-5. Hoarding is considered a very difficult problem to treat in most cases, and animal hoarding is no exception. If a person is willing, success is possible. Although treatment MUST be individualized, basic principles of respect and understanding apply to both types. For any treatment to be successful, it must address root causes. It would be a mistake for a therapist to consider the problem resolved simply because animals were removed, when in fact animals are a symptom, not a cause, of the problem. Lack of experience treating animal hoarders should not be a barrier to accepting such a patient. The most important consideration is for the therapist to be comfortable diagnosing and treating a wide range of disorders; treating co-morbid conditions such as depression may in turn help the hoarding behavior. It is also essential for the clinician to become familiar with the literature on attachment and trauma and the critical role of the human-animal bond. Although there are similarities with object hoarding, the two-way or interactive relationship with animate beings adds additional complexity and should not be discounted. A manuscript outlining key issues for therapists to consider was published in Clinical Psychology Review. An excellent reference is Addiction as an Attachment Disorder, by Philip Flores. 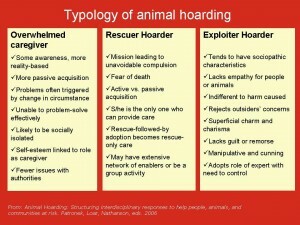 People engage in animal hoarding because of deep-seated needs which the hoarder has not found any other way to address. Therefore it is not uncommon for people to pursue this behavior even at the risk of alienating friends and family. In some hoarding situations, family members and friends have tried vainly for years to intervene, having little success in moving the hoarder to a more functional home and lifestyle which can accommodate social relationships. In the most extreme cases, marriages fail, children lose contact with parents, and siblings become estranged. A typical history includes repeated appeals to multiple social service agencies, with little to show for the efforts. Intervention in such a situation is challenging, but not impossible. Here are some suggestions for helping a family member whom you believe to be at risk. There is an excellent website for children of hoarders that provides extensive resources, including links to a Yahoo listserv and therapists. It can also be helpful to contact agencies or individuals providing services to elders at risk, since many but not all hoarders may be old enough to qualify for such services. Self-neglect, in addition to animal neglect, is associated with animal hoarding. Adult protective services agencies have long dealt with object hoarding, and are now becoming more familiar with animal hoarding. Another avenue of outreach is to contact the agency in your area that deals with concerns about animal abuse and neglect. This will vary widely around the county. The responsible agency may be municipal animal control or police, a non-profit organization such as a Society for the Prevention of Cruelty to Animals (SPCA), Humane Society or Rescue League. Note that all of these non-profit organizations are independent entities, each with their own policies, training, and procedures. Understandably, families may be reluctant to reach out to any organization perceived to be associated with law enforcement. Most agencies do not seek prosecution or the publicity associated with an adversarial approach, and would welcome the opportunity to work in a cooperative fashion to achieve a good solution for all involved. In order to locate the most appropriate agency, consider speaking with a veterinarian or inquire with municipal officials. Failure to provide proper care for animals is a crime in every state. 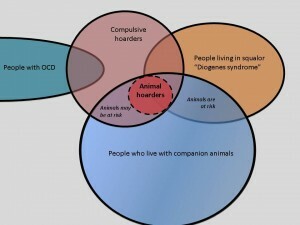 Although animal hoarders may suffer from a variety of mental health problems and behavioral predispositions, including how they respond to stress, that preclude them from providing proper care for companion animals, it is rare that they are found incompetent to stand trial. 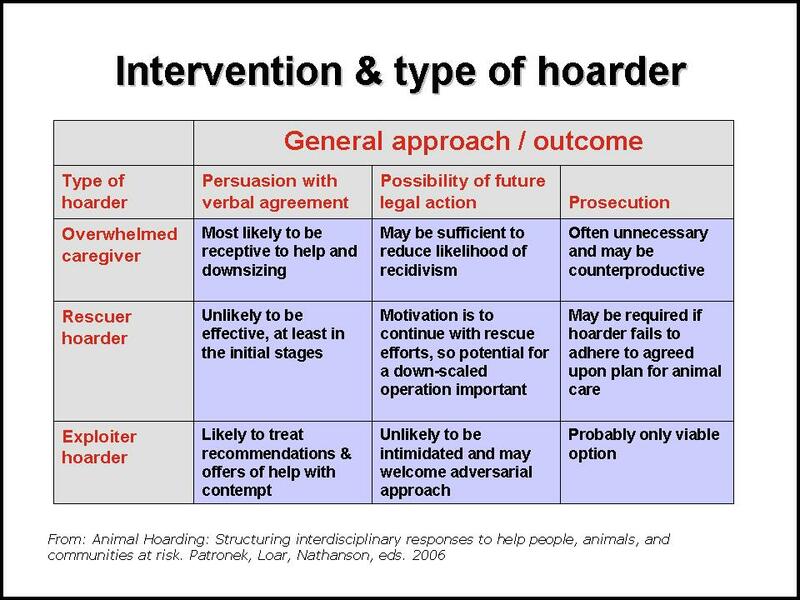 Furthermore, even though "intent" to harm may be lacking, most hoarding cases are characterized by a series of very deliberate acts and choices made by the hoarder, which placed their interest above the interests of animals (continuing to acquire, refusal of help, unwillingness to adopt, failure to seek medical care, failure to spay-neuter, etc.) that could all could lead to animal suffering and neglect. As a search of the Pet-abuse.com database will show, hoarders are becoming more likely to receive jail time if convicted. The Animal Legal Defense Fund has staff attorneys who are able to consult with prosecutors about how to approach any case of animal abuse. The website also provides sample legal pleadings and briefs. It was an animal hoarding case in Oregon that resulted in one of the strongest felony animal cruelty laws in the United States. However, as this story shows, prosecuting such a case can be extremely challenging, so thorough preparation is advisable. A May 2010 review is archived here. The Association of Prosecuting Attorneys also maintains an animal-law interest group. Providing proper care for populations of animals is discussed in more depth under Animal Welfare. 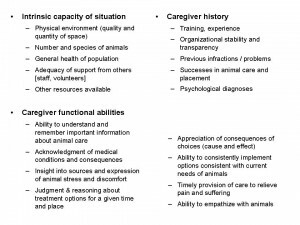 However, it is important to be aware that this requires a range of caregiver traits, skills and beliefs which all interact with the physical capacity of the environment to determine whether a person is capable of providing proper care for a particular number of animals at a particular time and place. Caring for populations requires much greater expertise than caring for a few pets. 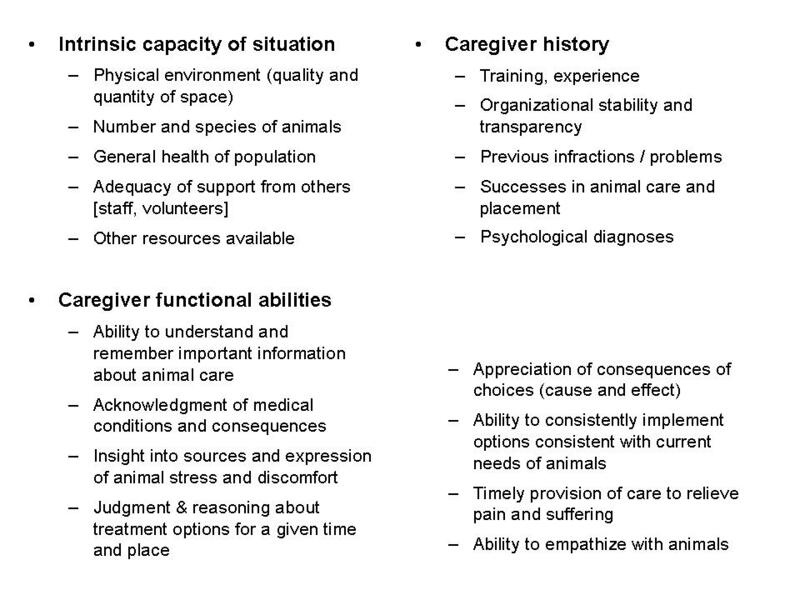 Criteria to consider when evaluating a person's capacity to provide care are outlined in the diagram to the right. Even the most antiquated cruelty statutes prohibit unnecessary suffering - it is the prosecutor's task to understand how hoarding results in such conditions. When a crime has occurred and a case proceeds through prosecution, excellent resources are available to help law enforcement and veterinarians document the extent and duration of negligent care. The International Veterinary Forensics Sciences Association is a new organization closely allied with the ASPCA that can serve as a resource regarding evidence collection at the scene and large scale rescue of animals. More and more veterinary schools (including Tufts, University of California Davis, Florida, Cornell, Penn) have established programs in shelter medicine, which are an additional resource about proper care. Large-scale animal rescue is best done using a disaster-type response model. 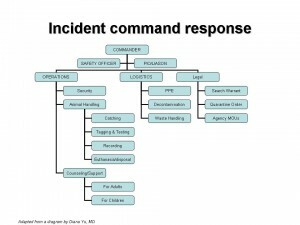 An incident-command-type system is preferred so that everything runs as smoothly as possible. 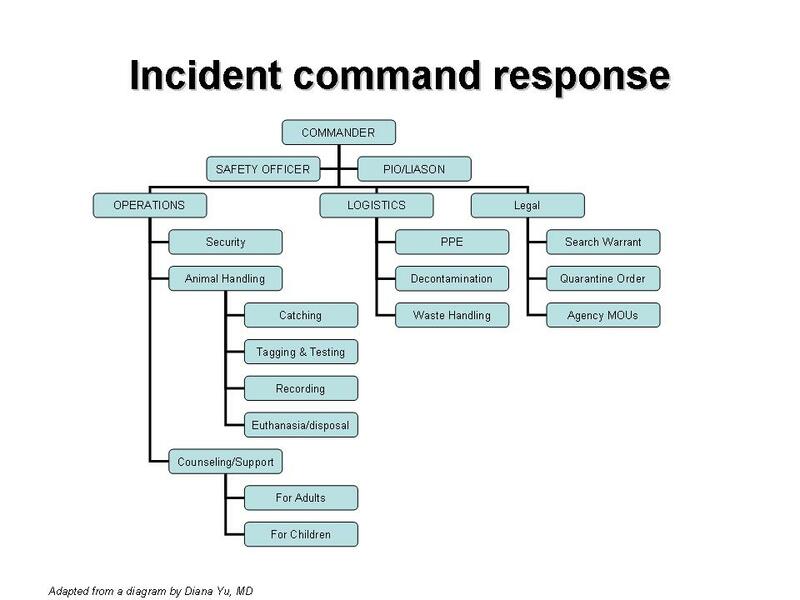 A diagram of a typical command structure used in a hoarding situation is shown on the right. This will best address the host of legal, logistical, health, safety, communication and humane concerns present during these circumstances. A response of this type should only be attempted by an experienced agency with good working relationships with all involved responders. Increasingly, large operations are being supported by national animal welfare groups. For further information, and for details about responding to smaller situations, see Animal Welfare.